All you have to do is download the app, follow all the instructions given in the app, select the crackers of your choice from the cart, burst it and enjoy the vibrant hues and starbursts. Fireworks AR playground experience makes you feel lost in the shower of lights. 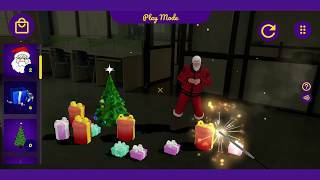 Celebrate this Christmas with Augmented Reality Santa Claus, Christmas Tree and Presents!